While being creative and mixing your Song, you have to find the best Reverb for your Vocal recordings, Synth, Drums, Snare or Piano Instruments. Here you get Reverb Mixing Tips, Reverb Vst recommendations and Free Reverb Plugin downloads. When mixing, use 3 different reverb rooms (small, medium, large) and create a single send effect channel for each one. 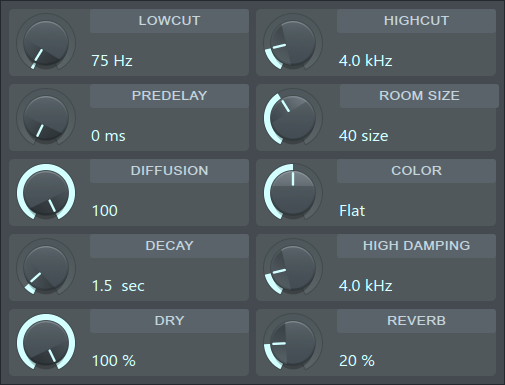 Now mix your instruments into the different reverb effect vst plugins. Mixing Tip 2: Pan a Instrument to the right, let's say 50%. Then create an effect-send channel and use the panning slider and set it to 50% to the left. Now place a delay and reverb vst plugin in the effect-send channel. Now you send your instrument, which is panned to 50% to the right, into the effect channel. Your instrument will be routed through the delay and reverb plugins and the sound will be much wider. Work with the Wet / Dry regulator to optimize the effects, because less effect is sometimes more. To produce a clear bass that still has reverb and spatiality, no reverb should be on the sub and low frequencies. Make sure that the reverb is only activated from 150-300hz. Everything under the frequencies should be a completely dry audio signal. If your reverb does not include an equalizer, you need to create a send effect channel. Next send your bass to the effect channel. First you use an equalizer in the send channel. With this you make a low cut for the low frequencies of the bass. Then you can add the reverb and hear a better result. Now mix the dry signal with the low cut reverb from the send effect channel. Mix these two tracks until you get the best result. Also try to tame your bass and Reverb using one or more compressors with a slight gain reduction of 3 to 5 db. The ratio can have an average value of 4:1 or 8:1. Your attack time should not be too short, as the attack phase of the bass should not be compressed. Test attack values between 40ms and 150ms. When you use Reverb on your mix, try to create contrast to make your mix sound more interesting. For example, use small rooms for vocals and large rooms for one of your instruments. Or try the other way around, be creative and test how you get interesting results. Play with the Pre-Delay and Dry / Wet controls to make the sound sound closer or further away. You can also bring life into your mix by automating the reverb as it changes during the track. Give less or more reverb in the individual passages of your song, by that I mean hook/chorus, bridge and verse. Here are some vocal reverb mixing tips. Often less is more, also when mixing reverb and vocals. Don't give 100% of the wet signal when using the Dry/Wet settings, but choose values that make the reverb less audible. Be sure to use the pre-delay function on your reverb settings, this will cause your vocal reverb to start a bit delayed. Try pre-delay setting between 50ms and 120ms, but listen for yourself and find the best way. The result is a cleaner result when mixing to prevent muddy sounds. Another mixing tip for reverb on vocals is to use the lowcut or low-shelf filter on an Equalizer. Play with your reverb settings and try to lower frequencie values between 200hz and 800hz and hear how it sounds best. If you want your reverb to sound really wide, it usually makes sense to use a delay. With a reverb effect you can send your vocal track into the background quite fast. But mostly vocals should sound very direct and close during mixing. To creatively use reverb effects and create a unique sound you can combine your reverb with other plugins. Try a chorus effect before reverb or a saturation effect after reverb to make your reverb tail sound different. As mentioned above, reverb automation is another way to make your song sound more interesting while arranging. Use the reverb only partially or change the room size at breaks in the reverb settings. This is my reverb comparison and price Guide. You can hear some reverb examples as well. Try these reverb effects for Ableton Live, Fl Studio, Cubase, Logic pro, Pro tools, Studio One when mixing your music. 8 of the most classic digital reverbs from the past forty years can be accessed in one single reverb plugin. A Few of these reverbs have never been released in a plugin before. VerbSuite Classics reproduce the actual tone and modulation characteristics of a reverb using LiquidSonics' proprietary Fusion-IR processing knowledge. Unlike static impulse responses found in a typical convolution reverb, Fusion-IRs are able to clone the evolving character of modulated digital reverbs which makes it possible to create the lively and convincing acoustic spaces so accurate for hit records. 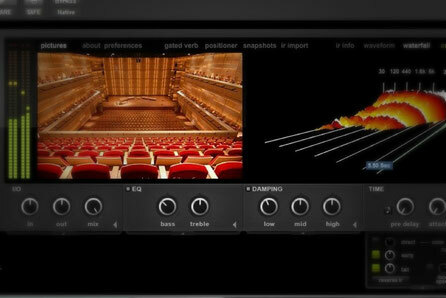 Exponential Audio Nimbus is an algorithmic reverb effect. According to the manufacturer, this reverb plugin is used in several movies and by Grammy-winning producers. 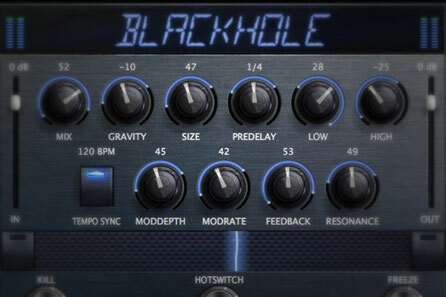 This vst effect is equipped with overdrive to give the reverb tail more warmth and assertiveness. There is also tempo synchronization to calculate the pre-delay automatically. There is also the option to dampen the reverb tail for more dynamics automatically. Another option is a compressor or expander with an included warp option. To get inspired, you can also click through the nearly 1200 presets. Lexicon is famous for its production of superior reverb devices, not without reason the hardware equipment was found in many famous recording studios. Meanwhile it is possible to imitate the special DSP predecessors with at least equal quality on computers. 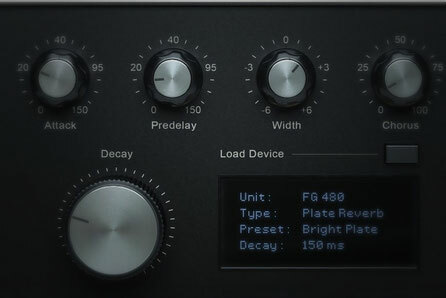 The Lexicon PCM Native Reverb consists of 7 single vst plugins. 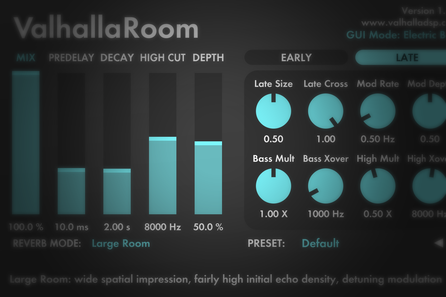 Another Valhalla reverb plugin with a simple GUI, always conducive to very quickly dialing in sound. Room sounds absolutely amazing and is very tweakable. 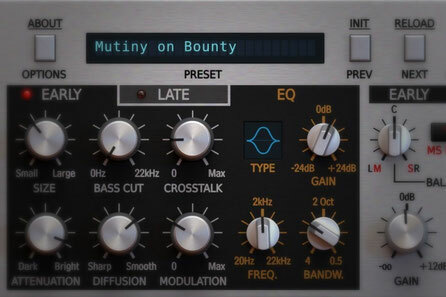 This Plugin is a little more tailored for clean and realistic sounding reverb. They'll put your drums right in the room with you or can add a nice airy sheen. 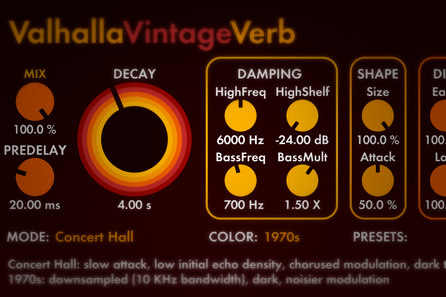 Valhalla Shimmer is one of my favorite reverb VST Plugins out there. 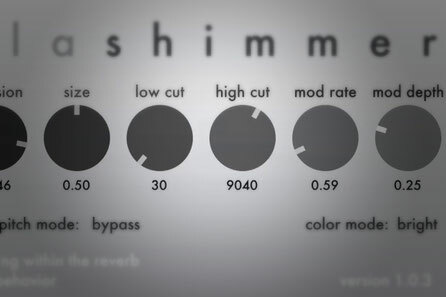 Shimmer is the best Reverb for Ambient Sounds and Synth Pads and can be described as a vast sounding Hall with a long and huge tail, which brings you into another world. 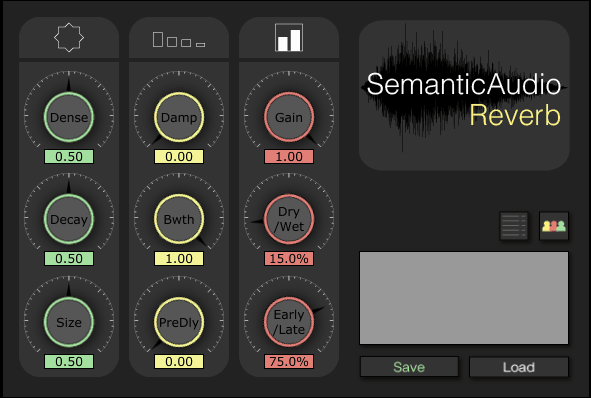 This Algorithmic Reverberation Plugin is not the most natural sounding Vst effect. The Interface is very minimalistic and easy to use. Shimmer also includes a pitch shifting function and a so-called bright and dark mode. Try it if you work on Techno and House Music and every kind of electronic music sound design. A Natural sounding algorithmic reverb, with dozens of room models. The VST Plugin is very easy to adjust to fit the mix, it is definitely one of the most flexible and great sounding reverbs on the market. Pro-R has a very nice workflow, for editing the decay and pre and post equing. 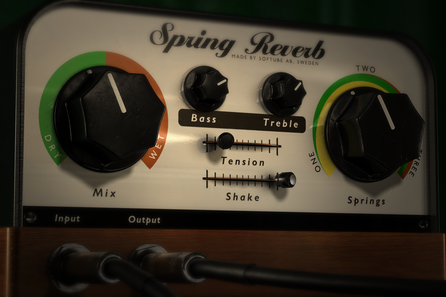 The overall reverb sound is kind of lush and known for its superb realistic musical spaces. Because of it's clean sound, Pro-R is almost invisible and you never have a problem with muddy sound layers. 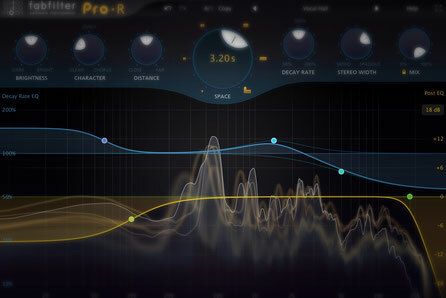 If you search a reverb which preserves the source audio and is not known for its special vintage character, than Fabfilter's Pro-R is your right choice. 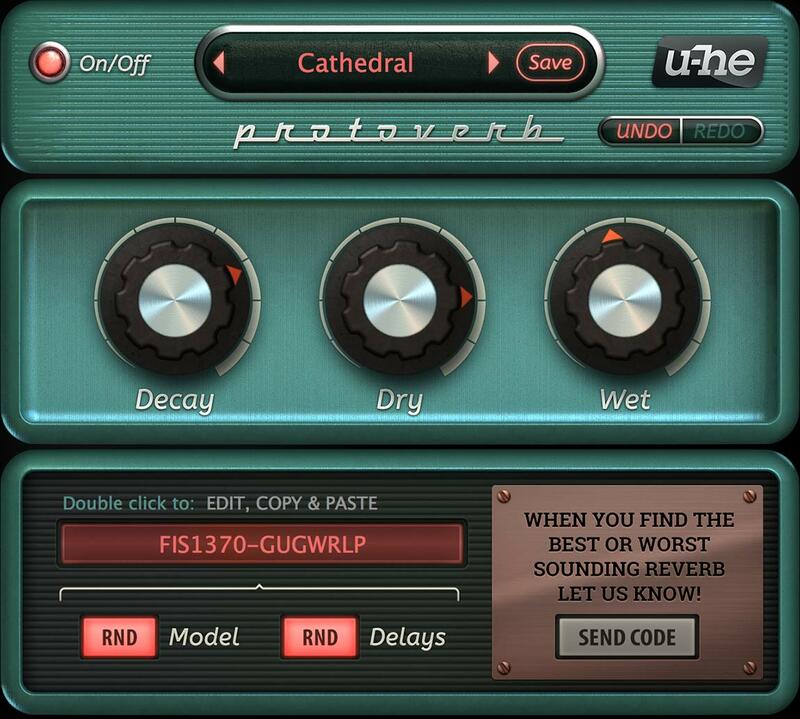 Recreate any type of reverb with Toraverb's algorithm based concept reverb, to achieve an excellent lush result. 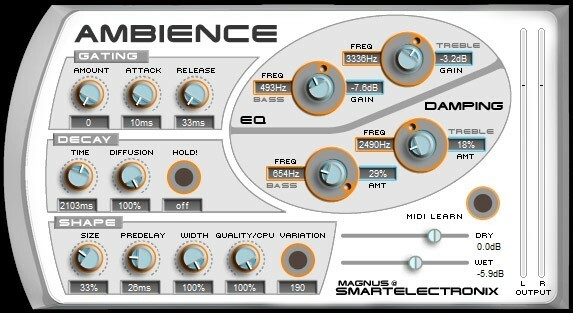 D16 is famous for its electronic music Vst Plugins; this is their Reverb Flagship you should give a try. 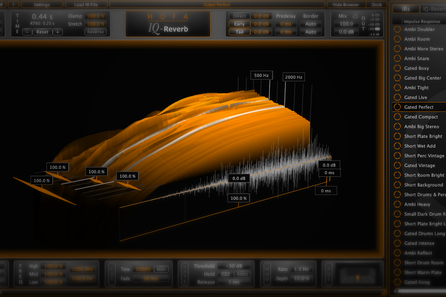 Toraverb is equipped with two independent, single band, fully parametric equalizers with 3 available curve types each. Like every Spring Verb, Softube's VST Plugin brings much character to your sound. Spring verbs are often used in guitar amplifiers. Spring verbs always have an extraordinary sound, so listen to some demo sounds yourself. Use this VST to give your vocals, snare drums, percussions, and basses a special feeling. Some say the sound can sound very weird with spring verbs; in any case, it generates some nonlinearities and subtle quirks. The Audio Ease Altiverb is a quite expensive, but ultimative convolution reverb. Even if this Audio Ease Reverb is very CPU hungry, you will reach the best results to put your Drums, Guitars or Orchestral Instruments into a Room. When you hear it you will realize that it's one of the most natural and realistic sounding reverbs out there. They went to real spaces and buildings to record impulse responses. A Reverb is the acoustic space that surrounds a sound(reverberation). The acoustic environment sound is influenced by other factors like, the length, width and height of a room. Another factor that influences the sound is the materials used to make the walls, floors or objects nearby. When you perceive a reverb, you hear closely spaced echoes and the sound created by the decay of the hall, influenced by the spatial design. A reverb is created in just about any natural environment, but can also be generated by a computer / DSP algorithm. These hardware devices or VST effect plugins are designed to create natural as well as supernatural environments. Why you should use reverb effects? Wet / Dry Mix: Ratio of effect to original signal. 1. The Hall Reverb realistically reproduces perfectly acoustically optimized rooms. These rich sounding rooms are typically concert halls, with minimal echoes and resonances that negatively impact the sound. Have you ever been to a classical concert hall optimized for several $100,000? If not, you should treat yourself to this sound experience in the next big city. 2. The Room Reverb is the classic tool for giving a basic spatiality to individual instruments or a complete mix. The room Reverb recreates realistic rooms with walls. So you can make your instruments sound as if you had recorded them in a cathedral, a large hangar, an acoustically optimized studio or in your living room. The Room Reverb creates a natural coloration and sounds very beautiful in combination with organic instruments. 3. 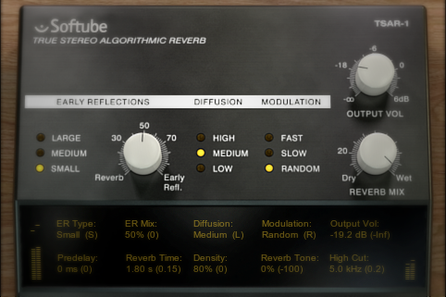 The Chamber Reverb is a nice warm, energetic reverb with a lot of vibe. This reverb is perfect for giving color to your instruments or vocals. The chamber reverb was born before the digital age. It was supposed to reproduce large optimized spaces, which was more or less successful. But well, in a positive spirit a new reverb was born. 4. Plate Reverb algorithms are preferred for drums, percussion and vocals. They usually have a bright, smooth sound and produce the typical shiny reverb tail. However, they are not defined by a realistic room. This reverb is a mechanical reverberation in which the dry signal is sent through a metal plate and then recorded again. This results in a very dense reverb, which has a lot of power when mixing. 5. The digital Algorithmic reverb can be generated without natural acoustic vibrations and echoes. Rather, echoes can be generated electronically by computer calculations / simulations. The advantage of the Convolution reverb is that it can simulate the reverb exactly and can sound very natural. This kind of reverb was very influential for the music of the 80s. In Fl Studio 20, three reverb effect plugins are included by default. You can also install more Vst plugins. On this page you will find an overview of other free reverb effects and higher quality plugins that you have to pay. If your Instrument is not already loaded, right click on "Insert 1" and click on "Routing" >> "Route Selected channel to this Track"